When Hugh Deveraux discovers his newly inherited earldom is bankrupt, he sets about rebuilding the family fortune—in the gaming hells of London. But the most daring wager he takes isn't at cards. A wealthy tradesman makes a tantalizing offer: marry the man's spinster daughter, and Hugh's debts will be paid and his fortune made. The only catch is that she must never know about their agreement. 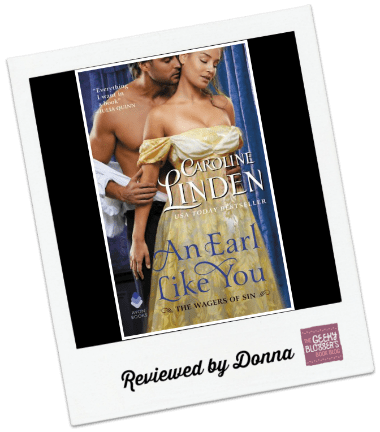 Heiress Eliza Cross has given up hope of marriage until she meets the impossibly handsome Earl of Hastings, her father's new business partner. The earl is everything a gentleman should be, and is boldly attentive to her. It doesn't take long for Eliza to lose her heart and marry him. But when Eliza discovers that there is more to the man she loves—and to her marriage—her trust is shattered. And it will take all of Hugh's power to prove that now his words of love are real. I have read, and own, every book Caroline Linden has written, and they just get better and better. This book is the second one in the Wagers of Sin series and it’s wonderful! Hugh Deveraux, Earl of Hastings, is a good man who is trying to keep his mother and two sisters from learning his deceased father left them nothing but their mortgaged estates. He moves them all to London as one town house will not be as expensive to run. He plans for his sister, Edith, to have her season and hopefully find a husband. He gambles, carefully, at the Vega Club where he meets wealthy commoner, Edward Cross, who wants his daughter to marry a lord. Eliza Cross is shy with strangers. She had one season, as a wallflower, and was miserable. She’s happy playing with her dog Willy, gardening and taking care of her father and their home. Her father wants her to have her own home, family and a title. When she meets Hugh, she is very attracted to him. Hugh is not happy about being bought by her father, but he must think of his mother and sisters, so he starts courting Eliza. As he spends more time with her, he thinks he wouldn’t mind marrying her. They marry quietly and eventually his mother and sisters come to like her. But then she finds out her father “bought” him, and she leaves. I hope you’ll try this wonderful book. Eliza is one of my favorite heroines. I’ve left a lot out as I don’t want to spoil anything. I can easily recommend this book.